NOTE: NO shipping charge. Local demo available to serious customers. ELAC‘s Andrew Jones welcomed us back into the room and we got some very gracious time for just the two of us to listen to this system. By coincidence, he played one of the songs that we had listed to together on the more expensive system. Well, my opinion was that she was correct. The ELAC system did sound better. I told Becky to trust her ears and not the price tag. 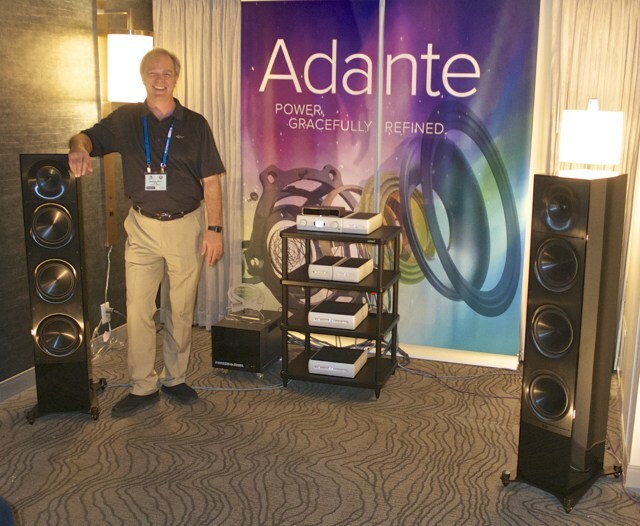 The ELAC system consisted of the Adante AF61 is $4,998.99 per pair. What you can see in the picture above are three 8-inch passive radiators sitting in a machined aluminum fascia. The “active” woofers are mounted behind the radiators. The bass was deep and controlled and the midrange was very transparent with excellent imaging and wonderful musical flow. They were powered by the excellent electronics from what is now called the Alchemy Series by ELAC. The price of the monoblocks and digital gear comes to a little over $5,000, but this was an incredible system at any price. We were very impressed and both agreed that it was one of the best sounds we had heard at the show. The Audio Beatnik: I didn’t include the ELAC room in the “Little Systems That Could” review because there is nothing little about this system. The truth is that without a doubt this system had to rank in the top ten system I heard at any price. To make this point let me share with you a moment from the show. Becky and I had been listening to a system with speakers that cost six-figures earlier. Then we went our different ways as she had some appointments to keep. Later in the day, I came down the hall and saw her coming towards me. The first thing she said was, “You’ve got to come hear these $5,000 speakers that I think they sound better than those six-figure speakers, and I want your opinion.” ELAC‘s Andrew Jones welcomed us back into the room and we got some very gracious time for just the two of us to listen to this system. By coincidence, he played one of the songs that we had listed to together on the more expensive system. Well, my opinion was that she was correct. The ELAC system did sound better. I told Becky to trust her ears and not the price tag. The ELAC system consisted of the Adante AF61 is $4,998.99 per pair. What you can see in the picture above are three 8-inch passive radiators sitting in a machined aluminum fascia. The “active” woofers are mounted behind the radiators. The bass was deep and controlled and the midrange was very transparent with excellent imaging and wonderful musical flow. They were powered by the excellent electronics from what is now called the Alchemy Series by ELAC. The price of the monoblocks and digital gear comes to a little over $5,000, but this was an incredible system at any price. We were very impressed and both agreed that it was one of the best sounds we had heard at the show.